The lightweight tent heater offers a heavy duty design with enclosed heating elements and a sealed motor for maximum durability. 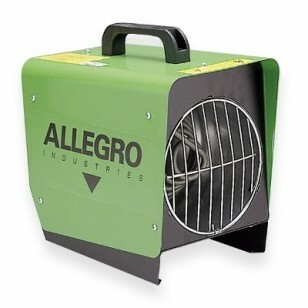 This heater will raise the temperature in any Allegro Work Tent up to approximately 50°F. Also features a metal grid exhaust outlet, plastic handle, and is powder coated green. This heater is user friendly and has proven reliability. Has a high quality sealed motor and overheat protection to ensure safe and effective use. CSA and UL Approved.